Earlier this week, we noted a review session for media of the plans for the Melrose & Pine development project slated to redefine E Pine at the base of Capitol Hill. That update is below — with an interesting new piece of information. 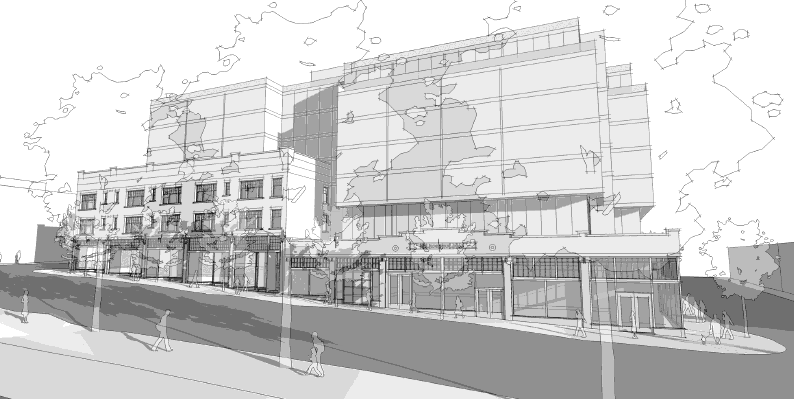 We asked — and the Madison Development Group has now sent out this rendering of their preferred scheme for the project. The diagram shows the project’s massing and design scheme only — it’s not the finished design — and there are still lots of details that won’t be available until the proposal is posted prior to the July 18th review but the drawing will give you a feel for what the developer and architect David Hewitt is trying to achieve — “It’s been our focus to save the buildings,” developer Tom Lee told CHS. 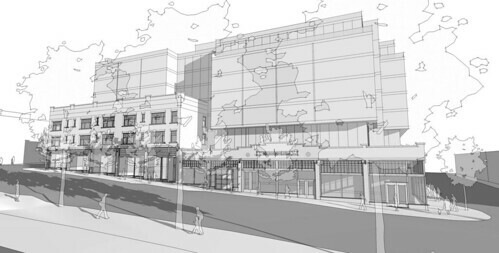 “We think the [Pike/Pine Conservation Overlay District] ordinance works.” The newly released rendering presenting a view of the future corner of Pine and Melrose and our update from earlier this week with a few takeaways on the project are below. Melrose-Pine Rendering_Updated 062812, originally uploaded by jseattle. The plan for the redevelopment of Pine between Melrose and Bellevue will finally see the light of day next month when the plan faces its first design review. The Madison Development Group has already run local journalists — including yours truly — through the line and showed their plans for the block currently home to Bauhaus, Mud Bay, the Pinevue Apartments and more. No cameras were allowed, no imagery or details were handed or mailed out after — though we’ve asked for a rendering to post — and the session was mostly an opportunity for reporters to hear about the plan and ask questions of architect David Hewitt. We’ll have more on the proposed 115,000 square-foot, seven-story development as the EDG date approaches. For now, we can tell you the preservation focus is Pine’s street-level retail with the two principal Melrose and Pinevue buildings restored and the new structures set back significantly and looming above the rebuilt character structures. There is the possibility a portion of the Melrose “Dirty Jane” building could also be included in the plan given the building’s potential desirability as a restaurant or retail space with historical character directly across the street from Melrose Market. There will be no such luck for the Melrose mound house, however. The first review for the project is slated for mid-July. Planning to be there? Tom Lee and David Hewitt gave a preview of the design a few weeks back. This is a great start to a project on an important site. Well done, and worthy of neighborhood support. Was there any discussion about how the new building over Bauhaus will be structurally supported? That section looks like it will most likely require new columns in the cafe space. Madison Development Group released an early rendering of the seven-story apartment project it’s planning at 301 E. Pine St. on Capitol Hill. The project would cover a half-block site between Melrose and Bellevue avenues that contains a pair of early 20-century brick buildings housing businesses such as Bauhaus Books and Coffee, and Mud Bay pet supplies. MDG said it would preserve the buildings and incorporate them into the proposal. The complex would have 160 apartments and 120 underground parking spaces. Additions to the buildings will be set back from the street, leaving the appearance of the older buildings intact. When MDG announced in April it wants to redevelop the site preservationists and neighborhood activists expressed dismay over the prospect of losing popular businesses and buildings that add character to the neighborhood. Tom Lee of MDG told the DJC in April that the plan has always been to preserve the buildings. Construction is slated to begin next year. A city review board is tentatively scheduled to discuss the design July 18. … is the EDG being held? Took me a second to realize those patterns on the building face were foliage across the street, not a giant exterior Mercator projection of the North Atlantic. Thanks to everyone who wrote letters and signed petitions and submitted objections early enough to change the direction of this proposal. Let this be an object lesson for those who reject participatory democracy as a rationale for property damage and cop-baiting.